Synopsis: The Barry White Story: Let The Music Play is an intimate portrait of the life and work of the legendary Barry White told through extensive archive interviews with the great man himself and new interviews with his family, friends and colleagues including Smokey Robinson, Ray Parker Jr., Nathan East, Taboo from Black Eyed Peas, producer Jack Perry, record company boss Russ Regan, Love Unlimited member and ex-wife Glodean White and his children. Fully authorized by the estate of Barry White, it tells how a poor boy from south central Los Angeles found a new life and worldwide success in music. It covers his early days as a writer and producer, the ups and downs of his career as an artist and the sad circumstances of his death. 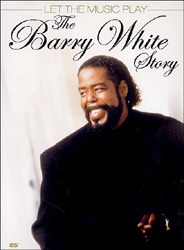 The story is illustrated throughout by footage of Barry White in concert featuring classic tracks such as: ‘Let The Music Play’, ‘Can’t Get Enough Of Your Love, Babe’, ‘You’re The First, The Last, My Everything‘, ‘Staying Power‘, ‘Never, Never Gonna Give You Up’, ‘It’s Ecstasy When You Lay Down Next To Me‘, and many more! I know very little about Barry White. I discovered his Love Unlimited project in the early days of my radio show, many years ago; I liked their first album, but appreciated the arrangements more so than the tunes. But when I discovered that Barry White was behind it, I picked up a few compilations from the library and discovered that I liked some of it – not all of it, but there were some key tracks that were quite yummy. Lately, I”ve been discovering a few of the r&b/soul greats, most notably Marvin Gaye and Betty Davis. I’d also explored Isaac Hayes and Curtis Mayfield in recent years and, while I’m not at all a convert to the genre, there are some delectable tunes and albums along the way. I’m broadening my horizon, and it’s an enjoyable trip. So when I stumbled upon this documentary on Barry White for 3$, I jumped at the chance: aside from reading a wiki entry, I didn’t really know where else to get a quick primer on the man, and I was actually rather curious to know what his story was, because he was a major chart mover for many years and he affected the way music was produced and performed for at least a decade. Unfortunately, ‘Let the Music Play’ is a major disappointment: it is so thin on details, that one only gets a vague sense of Barry White’s life and barely an indication of his place in music history. Firstly, it zooms through his career, the main focus of which being his first two or three albums, but then it rushes to his death, spending a disproportionate amount of time on the drama unfolding behind the scenes. Otherwise, there is very little personal background on White, including his formative years. There are few in-depth interviews with people who knew him. What we are offered instead are mostly brief commentary by some of his entourage and his family; there is precious else other than opinions and various claims that remain completely unsupported by concrete data or even by unfriendly parties. On the flip-side, ‘Let the Music Play’ serves up a few bits of concert footage along the way – but it’s not enough to pad an otherwise unsatisfying programme. If only they had included full performances or even unedited behind-the-scenes footage showing Barry White in action, it would have at least given us some real insight on the legend. Alas, the promise of ‘The Barry White Story’ remains unfulfilled.